When I volunteered to write an article, I fell back on the adage: write what you know. As a park planner and landscape architect, I am very familiar with designing and constructing parks, but I decided to write about something else I know well: accessibility within parks. I am the father of a 17-year old daughter with special needs. Her challenges are the result of cerebral palsy, which affects her mobility, making her dependent on a power wheelchair. Over the years, I have seen, firsthand, the unnecessary barriers many sites present their visitors, at both parks and other supposed “pedestrian friendly” environments. The frustrations I experience are as much from a parent trying to assist a child as they are from a landscape architect knowing that good design can prevent accessibility issues. On the other hand, I am bolstered by the accessible parks with programs and amenities that have inclusion at the core of their mission. It is good to point out that accessibility is not just about wheelchairs. It also covers improved access for many non-disabled groups such as parents with strollers, elderly with walkers and even inexperienced cyclists. Barrier-free access means all users can enjoy the site regardless of ability, age, or social status. From a land owner’s perspective, barrier-free access implies that user safety has been improved which subsequently reduces potential liability. It’s a win-win for both user and owner. The concept of access should start in the parking lot when a motorist becomes a pedestrian (unless access to the park is possible without vehicles). Meeting minimum codes for handicap parking is adequate (barely), but the location in the park is as important as the number of stalls provided. Access to trails or paths that lead to activities must be convenient, or users won’t come. Logic dictates that sidewalk curb cuts should be adjacent to the handicap parking, but that is often not the case. Trails are a great way to get all users involved in recreation at their comfort level, provided there are trail loops of various lengths from the trail head. I often walk with my daughter as she rides her three-wheeled bike on trails in central Arkansas. We are limited as to how far we can travel, so having trails with short, medium, and long options are beneficial. Trail width is also a consideration that comes into play at certain parks with paths less than 8’ wide. Since service or emergency vehicles may need to access park locations, it is my professional opinion, that trails should be 12’ wide where possible. Access to playgrounds is essential for the health of our children. According to a 2008 study published in the Journal of Community Health, "...children with easy access to a playground (less than two-thirds of a mile from home) are approximately five times more likely to have a healthy weight than children who do not have easy access to playgrounds.” With childhood obesity on the rise, it is vital that we appreciate the value of parks. Add to that the fact that some of these children are special needs kids who rely on caregivers for transportation and you have more than enough reasons to design parks for users of all abilities. 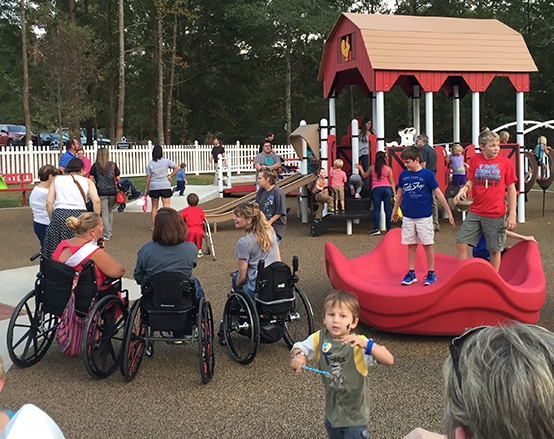 There are now many parks with programs created specifically with special needs kids in mind. Miracle League baseball is a great example of such a place. We take our daughter to play baseball at the rubber field in Little Rock where she gets to experience the sport much like any little leaguer in any town in America. The formula is fairly simple: a barrier-free field, the volunteer groups to help with the kids (so the parents can sit and cheer as fans), and the fun of the game that allows special kids to do what most of their siblings do. In one hour the volunteer “buddies” learn a valuable lesson on mentoring these special kids: stereotypes are broken, bonds are made, and laughter becomes infectious. 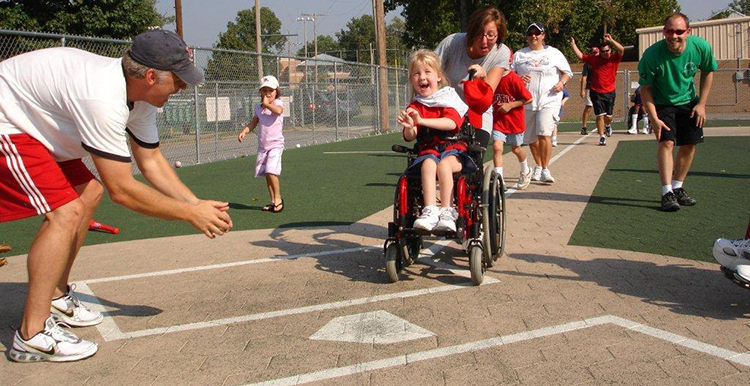 As a parent, I find myself grateful that Miracle League comes twice a year. I get to see her grin from ear to ear as she drives herself around the bases. I get to watch my daughter play a sport I never dreamed she would enjoy. I watch from the stands as a fan with a proud father’s smile on my face. Community Connections in Central Arkansas provides other special needs after school programs like flag football, soccer, dance, and karate. Some use the buddy system to help the participants and others use mentors and coaches. My daughter participated in the “I Can Dance” group that meets weekly to enjoy dance with the help of buddies to prepare for performances at local events. They dance each year at festivals, danced at an amusement park in San Antonio, and even performed at Walt Disney World in Orlando. These were all experiences that both the children and their buddies will remember for years to come. Barrier-free parks are achievable if the intent and funding are present and the details are considered. A new parent with a stroller gets a crash course on accessibility the first time they go for a stroll. A grandparent with a walker can tell you all about barriers they encounter. Designing for inclusion is just as easy if the intent is there. Whether its organized play, special programs, or playgrounds with amenities, the focus should be on providing opportunities for all users. Inclusive parks benefit all facets of the community, helping us learn from each other by breaking down social and cultural barriers, and in turn, helping make us better neighbors.